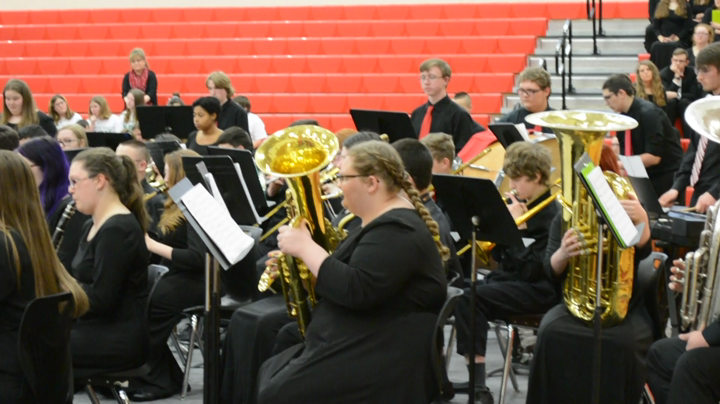 The concert band is the primary ensemble of the Boyd County High School Band Program. This ensemble rehearses 1st period during the school day. The BCHS Concert Band consistantly receives Distinguished ratings at the KMEA Band Festival. A large majority of the Concert Band members also continue to receive the highest ratings at Solo and Ensemble. To be a member of the band program wind players must be enrolled in the concert band class. Participation in marching band is required for all members of the concert band. Parents, please visit the Boyd County Band Boosters Assocation. The Boyd County High School Concert Choir is the primary ensemble of the BCHS Choral Program. The Concert Choir focuses on building individual vocal technique as well as performing within the ensemble. This group has grown to become a family that works together toward mastery. The Concert Choir performs several times each year including the BCHS Veteran's Day Ceremony, Basketball games, Christmas Caroling, and special events at the request of Administrators and Community Organizations. The Concert Choir Performs a Christmas concert as well as their Spring Concert at the end of the school year. Many of the BCHS Concert Choir members continue to audition for, and participate in All-State and All-District Choirs. The Jazz Band is devoted to the study and performance of jazz music. The Jazz Ensemble will perform various times during the school year. To be a member of the Jazz Ensemble you must be enrolled in concert band (if you play a wind instrument) or Percussion Ensemble (If you play percussion) . The Boyd County High School Guitar Ensemble is comprised of two beginning guitar classes designed to accommodate students who have no experience playing guitar. Reading traditional music notation and tablature are the fundamental methods by which musical literacy is obtained in this class. The Advanced Guitar class is designed for students who have taken the beginning class and are able to play fluently. The Advanced Guitar class often participates at school events and performances as requested as well as KMEA Assessment festivals. The basketball band rehearses one hour before selected basketball games. The purpose of the basketball band is to provide entertainment at basketball games and help cheer the basketball team on to victory. To be a member of the basketball band you must be enrolled in the concert band/percussion ensemble class. Participation in Basketball Band is required. The marching band is a very important ensemble during the fall semester. The marching band provides entertainment for football games and other school/community events. To be a member of the marching band you must be enrolled in either the concert band or percussion class. This class is designed to give our percussionist a well-rounded music education while at BCHS. During this class students will rehearse percussion ensemble literature, concert band literature, and marching band literature. The percussion ensemble is open to percussionist only. To be a member of the percussion ensemble you must be enrolled in the percussion ensemble class. Participation in marching band is required for all members of the percussion ensemble.